Just done a bit more work on this inspired by Eric Weber's work on the SubCommittee Forum. Eric's hardware choice works nicely and it is ready built from an eBay supplier, so no need for a soldering iron! The software, as shown, works with a Hall Switch to count revs and has a failsafe. The piston tank is protected by limit switches - I prefer the separate circuit for this with diodes across the switches, as shown in Norbert Bruggen's book. I am quite a convert to the Arduino, by the way. My original routine using PICs took about a year to get going. This version on the Arduino - not much time spent over 2 months. It uses an Arduino Nano - my favourite. Some health warnings this version has only worked on the bench, so far, not yet in a model submarine. Use it at your own risk. A short video showing the controller working with a home made piston tank built for my Nordenfelt subs. Hall switch (A1104 from Allegro) used to count revolutions and give proportional control. An error signal is generated from the Hall switch count and the r/c input pulse. When the unit is switched on it has 35 seconds to empty the piston tank and set the switch counter to zero. Loss of r/c signal (Failsafe) empties the piston tank and resets the switch counter. The Hall effect sensor is switched on when the south pole of a magnet comes close to the front tapering face of the sensor. Hall switch needs +5v supply. Nov 2017 Put pullup in software this seems to eliminate the need for a pullup resistor. AnalogSmooth routine not actually used. --you can read in any pulse, including standard PWM signals, Radio Control (RC) PWM signals, etc. 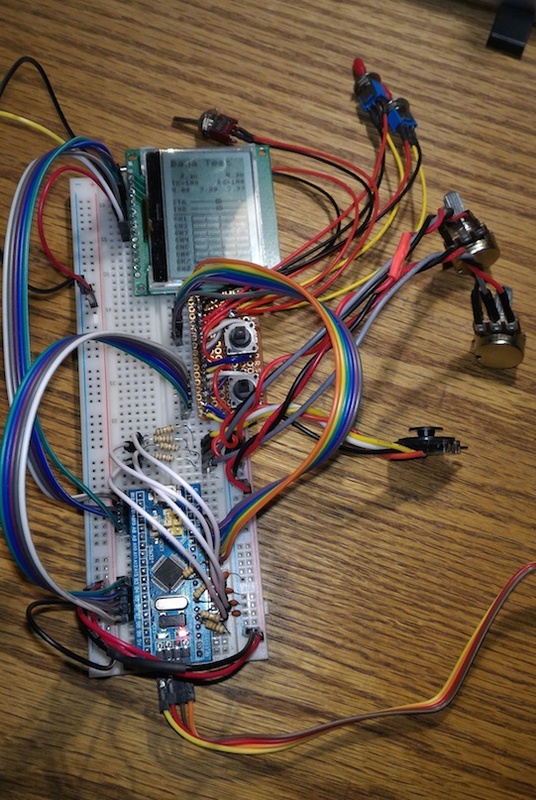 -I am using some low-level AVR code, which requires using some built-in Arduino macros to do pin-mapping. -this code only reads in a single channel at a time, though it could be expanded to read in signals on every Arduino pin, digital and analog, simultaneously. --this would be lots of work, so for now I'll leave that up to you. -My contact info is available by clicking the "Contact Me" tab at the top of my website. range from 1 (no smooting) to 100. //Digital input pin 8 for Hall switch input. delay(35000); //35 second delay to get piston tank empty from the start. delay(35000); //35 second delay to get piston tank empty. // //turn on PCINT0_vect Pin Change Interrupts (for pins D8 to D13); see datasheet pg. 73-75.
this was something i was planning to do but wasn't sure were to start. looks very good... would it be possible to have a list of parts? I liked the youtube video as well... seems nice and stable, no "hunting" once the piston position is matched to the stick position. 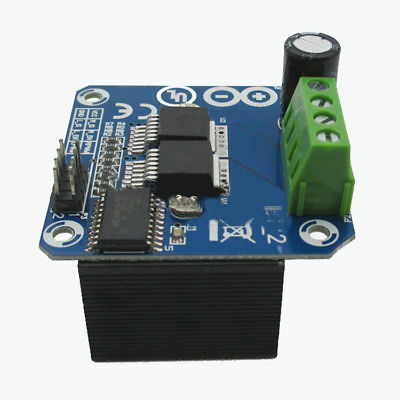 Option 1 – H-Bridge (use the first code sample and wiring diagram below) – NOTE: current is limited with the below module to 2A. My tank pulled more amps so I want with the ESC instead. (purchase of ebay. Example: http://www.ebay.com/itm/Stepper-Moto...o/170926726867 )"
There are not many other bits. The Allegro Hall switch (A1104 ) I got on eBay. I have a couple of ordinary diodes (but 10amp!) wired across the microswitches. You make an interesting point Tim T about the lack of "hunting". I used a 40Mhz receiver for most of the trials because it is more prone to interference and "glitching" than a 458 one. All the software has is a "deadband" of +/- 10 counts. The original pic software had a low speed approach to the set point and a few other things as well. A slow speed tank is OK with proportional control, I think. You just set the stick and go and do something else. I really like piston tanks but the thing that still holds them back is making them. Probably impossible without a lathe. Many thanks for the interest! eric's words on subcommittee ring absent in my case.... even though i have an account on their forum, i am not a member of the subcommittee, and that thread is in their restricted "private" area, accessible to members only. They are very cheap (about £5) and easily available. They are quite a beast in their specification - purportedly being able to switch 43 Amps. That would be a very large piston tank or a "Robot Wars" type of servo! 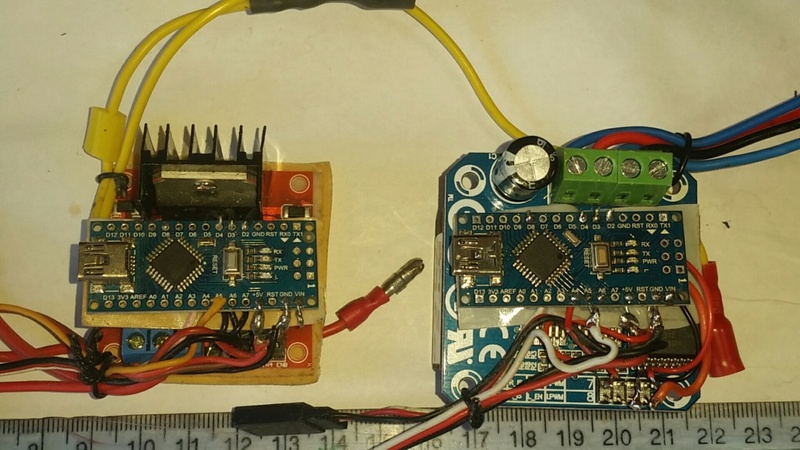 This photo shows the two Arduino proportional piston tank controllers. The original (2 Amps, I think) on the L.H.S and the new one on the right. Similar footprint but deeper to include a large heat sink. But nowadays, it is so much easier and cheaper for someone to simply buy one of these IBT-2 boards and control it with an Arduino. I will be taking both boards to Haydock Park (and a couple of Tom C's electric torpedoes) if any one wants to see them. How did you find these. I designing a twin version for my gato but works the same as the Tmax board. Well I have only tried it on the bench, so far, and I certainly haven't put 43 Amps through it! thats good to know, will order a couple and have a play. still need to convert the two piston tanks to have a linear pot. these are two libraries that are not standard..... can you provide links to them? Thanks for pointing these problems out. 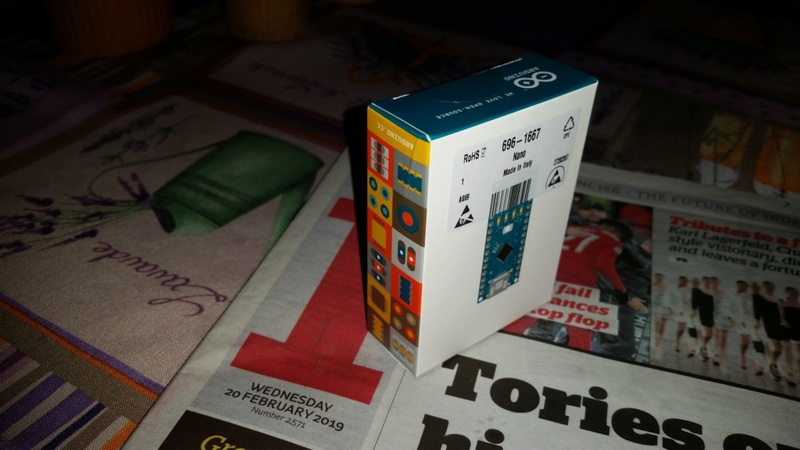 I am still finding out about the Arduino and libraries! after i posted the reply to you about the two different libraries, i did find a github repository with an older version of the eRCaGuy_Timer2_Counter library available for free. it appears the reason for the eRCaGuy_Timer2_Counter library is that it provides a much nicer, less "jittery" calculation for the receiver PWM signal coming into the arduino. in my code that i use on things like my robbe multi-prop decoder, i simply use the standard microseconds call. the reason this guy wrote his library is because the standard micros "system" call is shut off when interrupts are disabled, so the micros call is not guaranteed to be 100% accurate. you can see in the code, the disable/enable interrupts call is being used in the main loop when the "pulseCountsCopy" variable is being set. granted inside that block, two variables are being set, so not alot of time is spent there, but if we can remove it, micros might work well enough. I will keep you posted on what i find. A bit more hardware choice for the "Tims" and others interested. 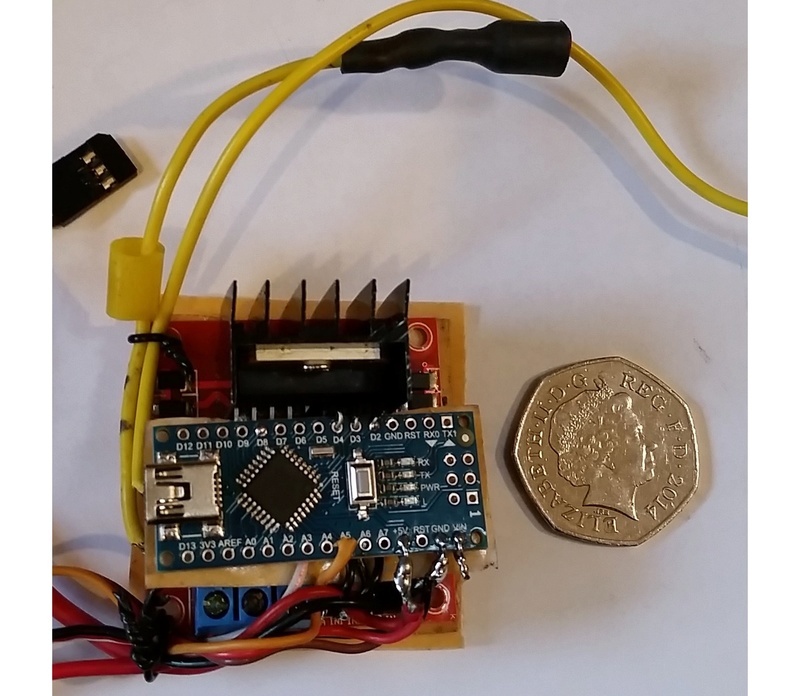 The photo shows the complete trio of easily available (ebay etc) H bridges used for proportional control using the Arduino. They range in current capacity from the (latest trial) at ) 0.6Amps to the 43 Amp one on the RHS. This is destined for a ballast shifting screw jack for my CSS Pioneer as the geared motor and screwed rod indicate. 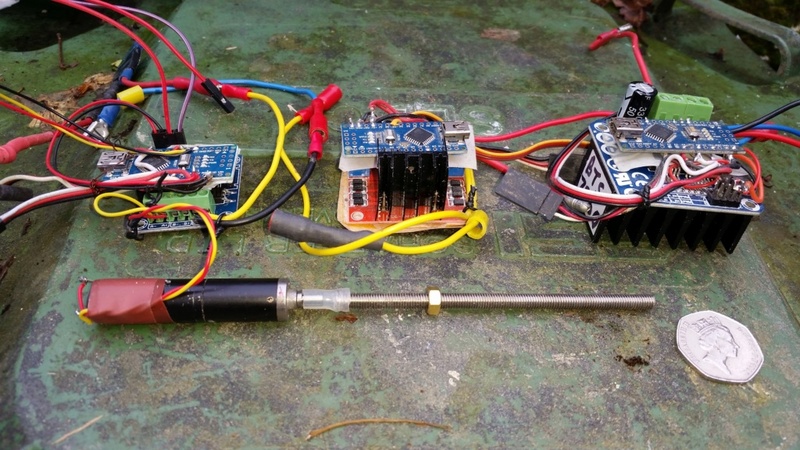 So not for a piston tank but the same software and Arduinos work in all 3. How are you getting on with the software Tim S ? I had a recent problem using my Nano clones when they stopped programming. It turned out that the Arduino bootloader has been updated. The latest IDE version 1.8.8 has the option to revert to the old bootloader. Micros are endlessly fascinating and annoying! not looked into the arduino 32u4 code changes, there basically aren't any. that cpu doesn't have a timer2, so nothing can be done. what i have done, is moved on to another platform. still using the arduino IDE, since it is so simple to setup and use, but i have moved to the STM32 family of chips. you can get boards similar in size to the mini arduino family of boards, but with 6x to 12x the horsepower, for $2 to $12 from china. they are also much more capable and easier to setup with things like timers and interrupts... i am all for anything that reduces complexity. it is $15.00, but that is for 5 of them, so $3.00 a piece. I am currently prototyping an 8 channel pistol radio with one. Are the logic pins on those boards 5v tolerant? the best way to answer that is with a graphic of the board's pinouts... as you can see from the legend, most of the digital pins are 5v tolerant, but most of the analog pins are not. to be honest, i don't really have a problem with the stm32 microprocessors being 3.3v. 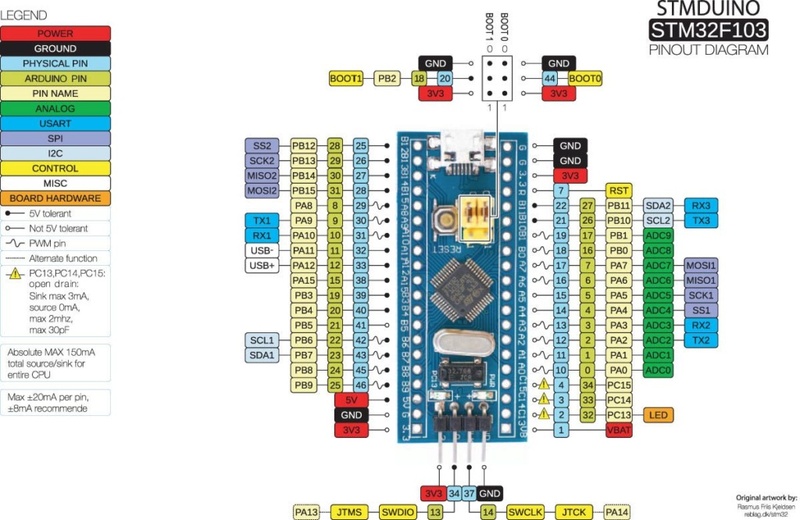 most of the things i am connecting to are actually 3.3v, and needed logic shifting to work with the 5v arduinos... shifting to the stm32 devices allowed me to remove that need. I have ordered one of these as a replacement for the pro micro arduino clone that i like. this one appears to be 3mm wider and basically the same length as the pro micro. when it arrives, i will be attempting to run David's proportional ballast tank sketch on it, hoping to have zero issues converting the code to run on it. I take a slightly different view when putting tech into a model thats cost hundreds/thousands in both time and money. I would prefer to spend money on the "real deal" rather than any clone in the hope (naive?) that it will be relaible (do what is supposed to do) and pay me back in terms of less grey hairs. I purchased 25 Nano clones a while back and I have at least 4 that didn't make the grade from the batch. I had an application that had multiple sub systems that the other boards I used just could not keep up with (was always dropping GPS data) - the Teensy no surprise cruised through it. That's funny. I must have anticipated your post C-3PO! My genuine Nano arrived in the post this morning. Proof above! Despite the failure rate I experienced they were good for what I used them for. Recently I have had some logic level convertors that were less than satisfactory - the solder pad circles where you attach a header were bady formed and virutally NO metal to solder onto!! not sure i agree with you 100%, especially in the modern era, where everything appears to be made in the same Chinese factory... with only a few exceptions. all things have limitations and "errata"... i will admit that the Teensy family of devices is nice, but i have not had the bad luck with the little boards you have had. every single one has worked, whether it was a "name brand" or not. to me, we are dealing with a hobby, not military grade hardware, and to me, my hobby is the last item on my list of where my money goes, so if i can buy 3 chinese stm32f4 boards instead of one Teensy, then i will be buying the chinese boards. interesting note about arduino... the schematics are open source, so technically the "clones" aren't really clones. Tim you raise an intertesting point re "clones"
Don't want to get hung up on this but my understanding is that there are real open source ventures ("Deek Robot") that produce their own boards and seem to be of a fairly good quality and then there are copies (clones) which even carry the Arduino/Genuino logo and proport to be the originals and are quite often of a less quality construction. - I guess "caveat emptor"